← The Killers (1946): What’s the idea? 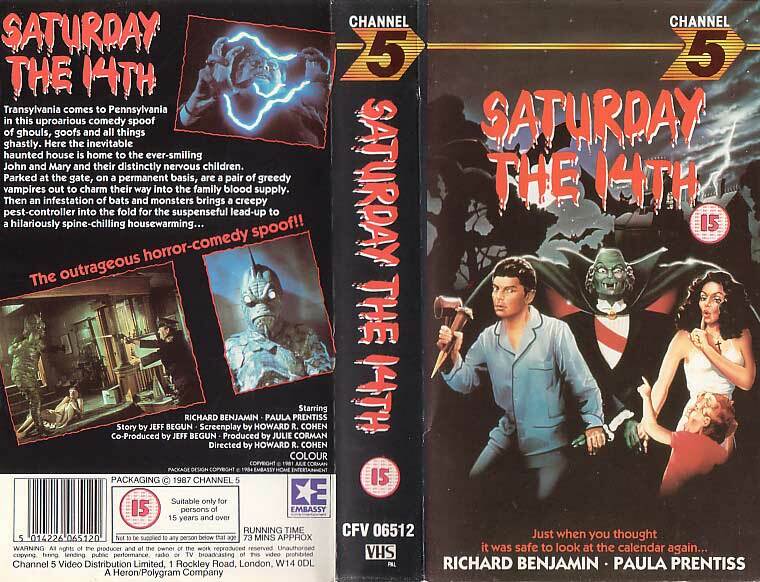 Saturday the 14th (1981) was perhaps one of the worst films I saw as a 10 year old (and I saw many, many bad movies back then) in large part because I had such high expectations for it. I was so looking forward to this movie primarily because I was already a huge fan of the Creature from the Black Lagoon, alas there was little in the way of character development on this score. This film marks a really interesting moment for me. The over-sized single screen moviehouse up the block was my mecca, yet the brand spanking-new VCR in our living room had opened up some unbelievable doors (never realized just how many it would close simultaneously). There needs to be a long series of posts on the bava about the Century Baldwin (the theater I grew up around the corner from) in relationship to the death of the movie-going experience in the US. It is something I often lament, but I am not sure whether it stems from a displaced notion of nostalgia on my part or a larger sense that the end of the single screen movie theaters with their elaborate marquees and detailed facades marked the end of something for all of us. How can the Cineplex 150 on the edge of nowhere that every one must drive to ever compete with the temple of smoke and mirrors at the center of our neighborhood? Anyway, this is the kernel of a much larger sequence of posts, it’s just that the day Saturday the 14th always reminds me of the dark, Coke, popcorn, and Dots filled excitement of interacting with a beautiful 35 mm screen in a building that cradled and fostered my seemingly limitless sense of wonder. This entry was posted in film, movies and tagged Baldwin Century, home video, VCR. Bookmark the permalink. The advent of the VCR seemed like magic to me. I didn’t understand about the doors closing, either. More in this series, please! Oh, and how could I forget the Terrace (a rocking chair theatre where I saw “Alien” and a bazillion others) and the Tower (where I snuck out to see “The Exorcist” one night after I’d told my mom I was going to see “The Three Musketeers”–hey, we got there too late, and my pals were up for a venture into darkness). Sadly I don’t have any good stories about personal experiences with single screen theatres (alas I think most, if not all were gone by the time I was born). One town over there is still a theatre in the heart of the town(called The Rialto)and it was once a one screen venue, complete with a balcony. My father grew up in that town so I heard stories when I was younger about him sneaking in (apparently quite easy to do) and what the theatre looked like. Now the theatre is split up into five screens that are obviously a lot smaller than the giant cinemaplex one but, I still really love that theatre and what it represents. Oh and The Rialto’s claim to fame is it made an appearance in the opening credits for the show “Ed”, just a piece of trivia for you hah. This may very well be my favorite quote from you, and given your verbal prowess, that’s saying something. What a beautifully confused fusion of spaces the Salem Theater must have been. How I wish to be there now. Do any of these places still exist in some recognizable form in Roanoke today? Does Jersey have movie theaters? Only kidding 🙂 I think part of the caravan might necessarily require a trip to the Byrd Theater in Richmond. A truly beautiful theater preserved in all its “Depression-era opulence” to quote Gardner. Your father’s stories about sneaking in the theater served an integral part these lost spaces. During the Summers, four or five of us would line-up at the rear-doors of the Century Baldwin and wait for a friend who paid to get in to ope them for us. The paying party had to time the offense just right in order to avoid the wrath of the usher. I saw Jaws, Groove Tube, and the Island of Dr Moreau for sure that way, and it was funny how many of the bigger, bullier kids in the theater would often harass us during the film -constantly threatening to turn us in to the movie theater authorities. It was such a different social space then the cow-herding that goes on today. Not only did most of us try our first cigarettes (and in some cases far ‘worse’) under the cover of darkness, but we often talked and interacted with the film excessively. Many of which we had already seen innumerable times in that same theater. One Summer, during the last gasps of this monument of my childhood, they played Star Wars and Clash of the Titans as a re-run double-feature matinee all Summer long for 75 cents a pop (extremely cheap back then in 1983 or 84).